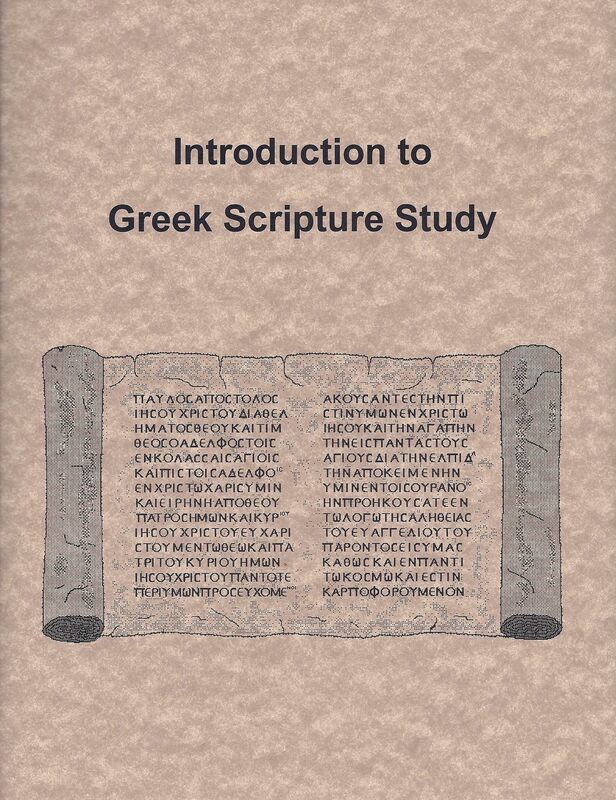 Introduction to Greek Scripture Study is available for those who have an interest in the Greek language as it relates to the study of the Scriptures. The course is designed for individual study using a workbook, audio recordings, and various reference books. The course includes more than learning a language. It is designed to help students in their study and consideration of what the Scriptures say. The course begins with the Greek alphabet and some basic information regarding language and the reference books that may be used in the study of the Scriptures. Later sessions include some of the grammar and syntax of the Greek language and considerations in the study of the vocabulary and text of the Scriptures. The course requires an invested interest in that certain reference books will be needed in addition to the $250 registration fee for the course. For many people, language study may not be inside of the scope of their interests. On the other hand, you may find that learning some of the basics of the Greek language will help you in your study of the Scriptures. Copyright � 2000. Walter J. Cummins. All rights reserved. The �Introduction to Greek Scripture Study Self-Study Course� consists of a series of audio recordings and a workbook entitled Introduction to Greek Scripture Study. There are approximately ten hours of audio recordings, which are divided into fifteen lessons corresponding with the workbook. The audio is in MP3 format on one CD. Although there are only ten hours of audio recordings, it will take many more hours to learn the material handled in these fifteen lessons. A person may progress through a portion or all of the lessons at his or her own pace. The course materials are for personal use. However, a person who has acquired the course may also choose to study with others who have also acquired the course. It is also recommended that each student have an associate who is already acquainted with the Greek language and with whom they may confer with regard to questions arising during the study of the lessons. In addition to the workbook and audio materials for the course, certain books are recommended for your continued study of Greek over the course of these lessons and in your own personal study. Not all of these will need to be acquired at once. Students may start with a Greek text and lexicon, and later add other materials as needed. � A Greek text: An interlinear Greek-English text would be helpful, especially one of the editions that has the Stephen's text and footnotes of variant readings from 7 other critical Greek texts, such as the interlinear editions by Berry and Newberry. The more current text of Nestle/Aland containing footnotes of variant readings from ancient manuscripts would also be valuable at some point. George Ricker Berry, The Interlinear Greek-English New Testament, Zondervan Publishing House, Grand Rapids, Michigan. Thomas Newberry, The Englishman�s Greek New Testament, Zondervan Publishing House, Grand Rapids, Michigan, 1970. Nestle-Aland, Novum Testamentum Graece (27th ed. ), Deutsche Bibelgesellschaft, Stuttgart, Germany, 1993. � Greek lexicons: A lexicon defines words, and it would be helpful to have one or more lexicons for that purpose. There are a number of lexicons available for that purpose, such as those published by Bullinger, by Thayer, by Bauer, and by Kittel. Ethelbert W. Bullinger, A Critical Lexicon and Concordance to the English and Greek New Testament, Zondervan Publishing House, Grand Rapids, Michigan, 1975. Joseph Henry Thayer, The New Thayer�s Greek-English Lexicon of the New Testament, Hendrickson Publishers, Peabody, Massachusetts, 1979. Walter Bauer, A Greek-English Lexicon of the New Testament and Other Early Christian Literature, translated by William F. Arndt and F. Wilbur Gingrich, The University of Chicago Press, Chicago, 1957. Gerhard Kittel, Theological Dictionary of the New Testament (10 Volumes), Wm. B. Eerdmans Publishing Company, Grand Rapids, Michigan, 1964. � An analytical Greek lexicon: An analytical lexicon lists the forms of words and tells what the forms are. Different editions of an analytical Greek lexicon have been produced, such as those published by Moulton and by Perschbacher. Harold K. Moulton, The Analytical Greek Lexicon Revised, Zondervan Publishing House, Grand Rapids, Michigan, 1978. Wesley J. Perschbacher, The New Analytical Greek Lexicon, Hendrickson Publishers, Peabody, Massachusetts, 1990. � A Greek grammar: A grammar is useful for the understanding of the occurrence of various constructions in the Greek language. One that will be cited frequently in these lessons is a grammar by Dana and Mantey. There are other grammars that have more details and examples with regard to the standards of grammar that may also be consulted, such as those published by Robertson, by Moulton, and by Blass/DeBrunner. H. E. Dana and Julius R. Mantey, A Manual Grammar of the Greek New Testament, The Macmillan Company, Toronto, Ontario, 1927. � A concordance lists words and where they occur in the Scriptures. There are many different concordances available that are arranged in different formats from the classical works of Young and of Strong to the more recent computer software packages. One or more of these works may be helpful in finding the occurrences of the Greek, Hebrew, and English words that are used in the Scriptures. � An English dictionary and an English grammar or style book would also be helpful. The �Introduction to Greek Scripture Study Self-Study Course� is copyrighted by and remains the property of Walter J. Cummins, and it is licensed to you when you accept these considerations and terms of agreement. The audio recordings and workbook are licensed to you for your personal study and for your study with others who have also acquired the course. You may copy pages of the workbook for your personal study, but you may not reproduce and distribute the workbook to other parties by any means. You may copy and play the audio recordings in any of the following ways. You may play the CD using a CD-MP3 player or computer MP3 player. You may make a copy of the original CD for back up. You may also transfer the files to a hard disk on your computer, provided the computer is not used on the internet or provided the files are protected from the internet by an adequate antivirus program, firewall, or other protective device. The computer you use for these audio files must be sufficiently protected so that the audio sessions are not able to be altered by anyone or transferred to anyone on the internet or by any other means. Disk space required on a hard drive for the MP3 files is about 553 megabytes. If you have the appropriate software and sufficient hard disk space, you may also convert the MP3 files to wave files on your hard disk, and you may transfer them to CD�s in regular audio CD-R format with the original audio content. You may not edit the audio content. Much more disk space will be required on a hard drive for all of the files in wave-file format. If you plan to burn regular audio CD�s of all the files, please keep in mind that it will require at least 12 CD�s (using an 80 minute / 700 MB CD-R). Every copy of the audio CD�s that you produce must be labeled with either a handwritten or printed label that contains the title (Introduction to Greek Scripture Study), type of audio (either Audio MP3 or Audio CD), the lesson number and tracks from the lesson, and the copyright notice (Copyright � 2000. Walter J. Cummins. All rights reserved.). Please keep in mind that this material is licensed to you to use in this manner, and so any copies of the audio recordings that you make must be retained by you. They are your responsibility, and they must be retained in your personal library for your personal study and for your study with others who have also acquired the course. All other rights not granted above are reserved. You may not make copies, sell, rent, or reproduce the workbook or any of these audio recordings in any format (electronic, optical, transcribed, or otherwise) for distribution to other people. You may not send them to anyone via the internet, e-mail, World Wide Web, or any other means. The right to use the workbook and audio recordings in the manner described above is granted to you, and those rights may not be transferred to another party. You may not use them in any manner other than those described above without written permission of the holder of the copyright. Violation of any of these rights will terminate your right to use this material. Introduction to Greek Scripture Study Self-Study Course," you may click the link below. You will be directed to a page where you may agree to the above considerations and terms of agreement and purchase this course.